Handle: Kraftform Micro with non-roll feature and rotating cap, multi-component. The 05030105001 Wera Kraftform Micro 1578 A Slotted Screwdriver is one of thousands of quality tooling products available from MRO Tools. 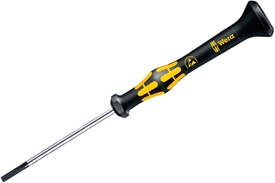 Please browse Wera ESD Series Tools for tools similar to the 05030105001 Wera Kraftform Micro 1578 A Slotted Screwdriver. 05030105001 Wera Kraftform Micro 1578 A Slotted Screwdriver description summary: Wera Kraftform Micro 1578 A Slotted Screwdriver. Blade Thickness: 0.50mm Blade Width: 3.0mm / 1/8'' Shank Overall Length: 80mm / 1/8'' Handle Overall Length: 97mm Quantity discounts may be available for the 05030105001 Wera Kraftform Micro 1578 A Slotted Screwdriver. Please contact MRO Tools for details.